What is the price of stone crusher and sand making machine with capacity of 80 tons per hour? Question: What is the price of stone crusher and sand making machine with capacity of 80 tons per hour? Detail: What is the price of stone crusher and sand making machine with capacity of 80 tons per hour? The stone crusher and sand making machine with capacity of 80 tons per hour is also a gravel aggregate production line. The production line is generally composed of vibrating feeder, jaw crusher, cone crusher / impact crusher, sand making machine, vibrating screen, sand washing machine and other equipment. Wherein jaw crusher is mainly used for coarse crushing of rock material. The big stone can be crushed to medium grain. Cone crusher and impact crusher are used for fine crushing of medium grain that are processed by jaw crusher. Cone crusher is mainly used to crush basalt, granite, river gravel and other hard rock material, and impact crusher is applied for crushing low hardness material, such as limestone, dolomite, concrete and so on. And then, we should use sand making machine for further crushing, shaping to make 1-5mm sand. 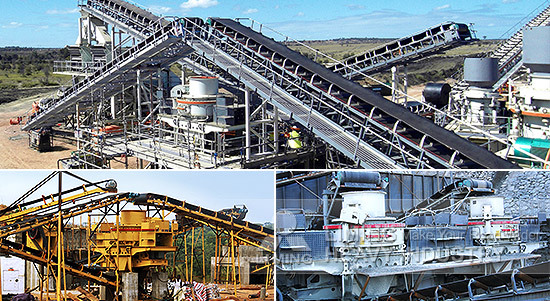 Each type of crushers has different specifications. We can configure the sand aggregates production line with capacity of 50-800 tons per hour. If you have any needs, please contact with us! <<Previous：I want a grinding mill with capacity of 1000 tons per day, can you give me some details? <<Next：How much is a Raymond Mill with output size 1000-1250 mesh?